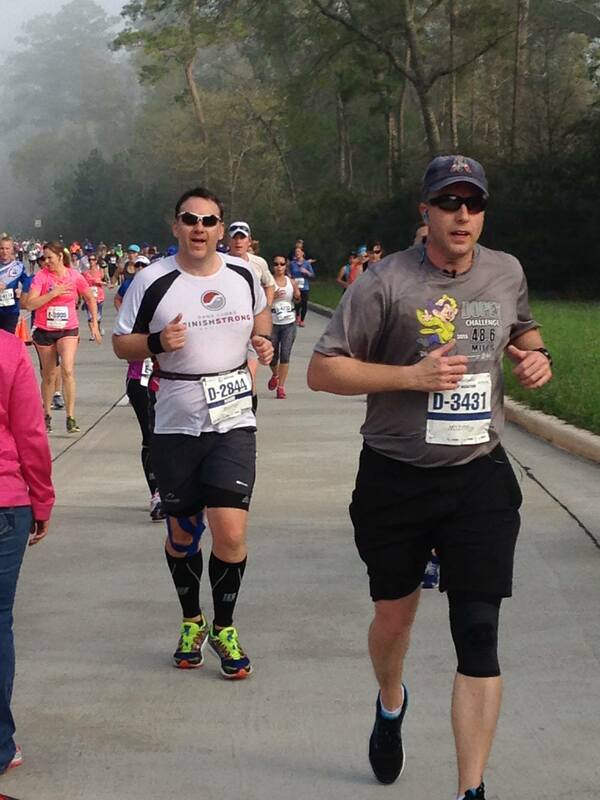 Finish Strong was well represented by 107 athletes at The Woodlands Marathon/Half Marathon on Saturday, March 4. Twenty-eight Finish Strong athletes completed the marathon. 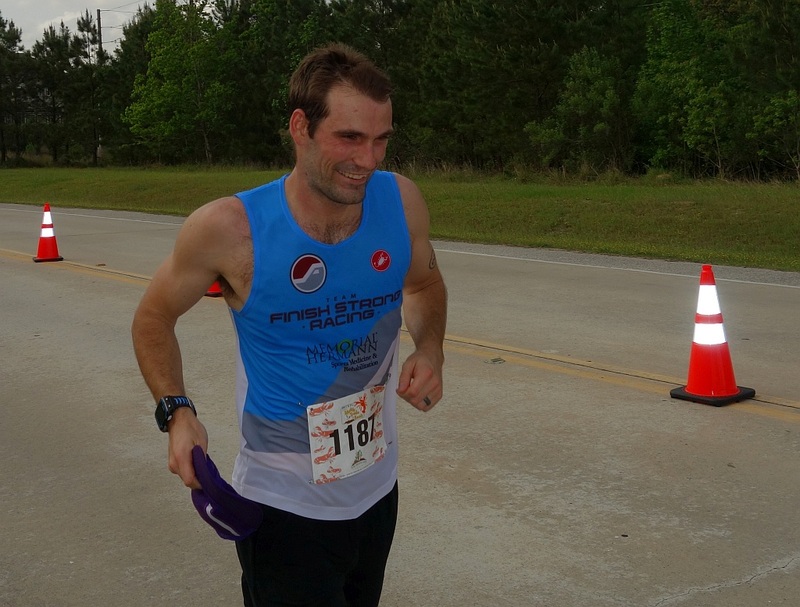 FSC Coach Ronnie Delzer finished 5th overall and 1st in his AG in the marathon in a PR time of 2:39. Rebecca Tortorici was the first FSC female to finish the marathon. 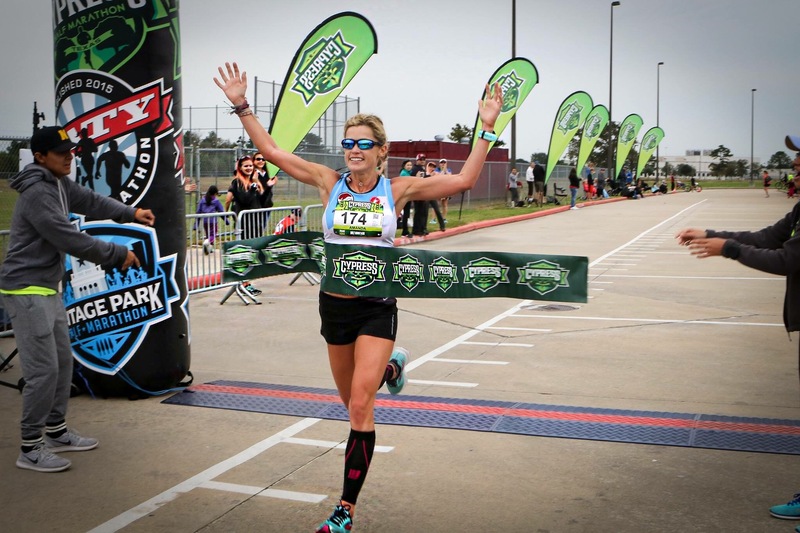 She was accompanied by husband John and Sarah Moore ran marathon relay along side Rebecca to help her reach her destination with a PR finish. Another athlete, Senthil Kumar, had a huge 33 minute marathon PR! Taking on marathon distance for the first time were the much photographed Lynn Bennick, Julia Belforti, Andrea Johnson and Nick Crafton. Special shout out to Bob Bailey and Sara Vanderford for leading Andrea to the finish line. 78 FSC athletes completed the half marathon. Elite runner Ryan Miller took 2nd overall in 1:08:47. Also on the podium for the half marathon were Dale Claudel (2nd in AG); Mark Fanelli (2nd in AG); Pam Meaux (1st in AG) and Deb Lyons (3rd in AG). There were some phenomenal PRs with James Carlson and Jessica Callan besting their personal best by over 12 minutes; Erik Van Den Berg finishing over 8 minutes faster; Eduardo Garzon continuing his reign as PR King by establishing a new PR with each race. Other PRs were established by Laura Machala, Arran Keith, Michelle Correal, Dulce Del Angel, Ken Page, Sheri Bell, Adnan Afzal, and Cheryl Perry. Preston and Christie Chandler ran in memory of Christie’s mom who passed away this summer. In the 5K, Finish Strong’s Jennie Hatler finished 2nd female overall in 19:58. And completing her first 5K ever was Swapna Vipin. Many of our SelecTRI families took part in the Family 2K Run Run on Friday, including the Belforti family; Quinn family; and Decker family. Thanks to the Quinn’s for passing out fliers for our youth programs at the 2K and to Nikki, Steve and Asa Wolfe who manned our SelecTRI tent at the Marathon Finish Line Post-Race Party. Kudos to Dutch Thomson of MP3 Therapy and Training who helped with our post-race aches and pains with his myofascial stretching. Christina Farooq 4:05:03 13th marathon! Senthil Govindarajulu 4:18:22 PR by over 33 min! Swapna Vipin 0:52:18 First 5K! More photos posted on our Finish Strong Coaching Facebook page. Congrats to all! Congrats to Finish Strong’s elite runner, Ryan Miller, for starting the 2017 run racing season with a victory in 51:15 at Texas 10 Boerne! Also representing Finish Strong well were Mike Menster, Kevin Baker, Katerina Savielova, and Mark Fanelli. Finish Strong’s Alan Jones and Amie Quinn excelled at Triathlon Grand Prix held on Saturday, October 22. The race is a 250 yard swim, 5 mile bike, 1.5 mile run – then repeat! The entire race takes place on the race course campus. Alan captured the male master’s title and was 7th overall. Amie won her AG. Karen Goodwin and Christy Gonzales both took 4th in their respective age groups. Woo hoo! Alan Jones claims master’s award at Grand Prix Tri! Gotta love the awards given by Race Director Lars Finanger!